School committee members want travel teams to have gender-specific chaperones. The regional high school committee this week continued to grapple with how to handle gender-specific chaperoning of sports teams for off-Island events. 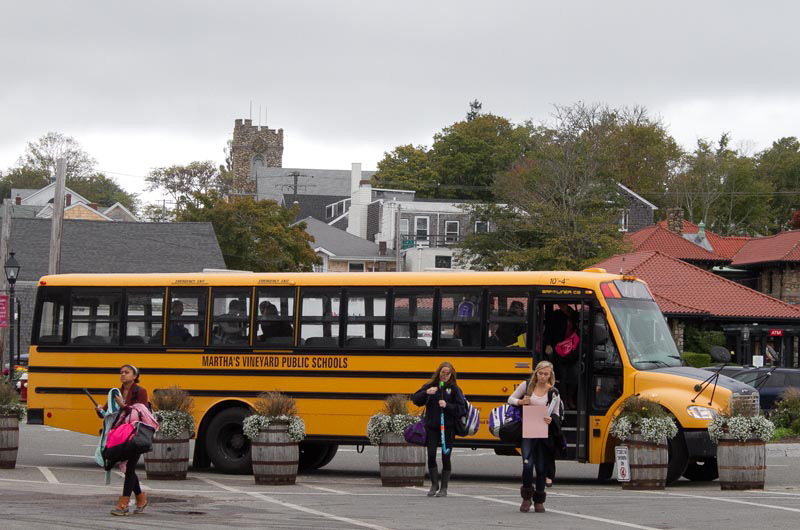 The issue came up last month when school committee members Kim Kirk and Robert Lionette voiced concerns that athletes sometimes go off-Island for sports trips without an adult chaperone of their gender to accompany them. For upcoming fall sports, teams where that will be the case include women’s soccer and women’s cross country. Both teams have female athletes and male coaches. In field hockey, there are female coaches and one male player. At the district school committee meeting Monday, principal Sara Dingledy cautioned committee members to think the policy through before adopting it. “There will be forfeits, and there will be a cost academically,” she said. She also said logistically finding chaperones for each off-Island trip could take teachers away from classes and hike costs for athletics. She suggested an end-of-season survey to gather input from athletes, coaches, and parents about the issue before any formal action is taken. Ms. Kirk and Mr. Lionette were unconvinced. A lengthy discussion of how best to recruit, train and pay chaperones ensued. Some school committee members felt parents from sports’ booster clubs would be willing to go with teams on trips. Others were uncomfortable with the idea of a teammate’s parent playing that role. School accountant Mark Friedman said funding an on-call position is challenging from a budgeting perspective, as game schedules are likely to change. Track coach Joe Schroeder was present and outlined what a typical fall schedule looks like for away games across all sports. “You’re looking at 20 dates out of the building before the month of November starts,” he said. In the end the committee agreed to ask interim assistant principal Jeremy Light to review other high schools’ policies on chaperoning sports teams. But citing qualms about the chaperoning issue, Mr. Lionette, Ms. Kirk, and Jeffrey (Skipper) Manter 3rd voted against Ms. Dingledy’s proposed athletic handbook until the issue is resolved. (Mr. Manter had some additional concerns about the handbook’s chemical use policy and parking for students driving themselves to the ferry.) With fall sports around the corner, that means the high school is without an athletic handbook until the school committee can agree on chaperoning rules. In other business, Sam Hart, executive director of ACE MV, the Island’s adult education organization, began a presentation about further aligning his program’s mission with the high school and high school students. Discussion was cut short when one committee member had to leave early and a quorum was lost. We will revert back to the policies and procedures in the athletic section of the prior year's handbook. There are very few, if any, policy changes in the new MVRHS Athletic Handbook that are not already outlined in the 2018-19 MVRHS Student Handbook (approved by the School Committee last month). With the new, updated Athletic Handbook--the one that did not pass in last night's School Committee meeting--we were simply incorporating feedback from families and students to make it easier to read and more accessible. That said, in the absence of School Committee approval, we will begin the fall season with the same rules, policies and procedures that were in place last year under the former document. Where is this coming from? If we don’t trust the coach, regardless of gender, to accompany his/her team to off island competitions, why are they coaching at all? Either you trust the coach or you do not. This seems like a solution for a problem that doesn’t exist.